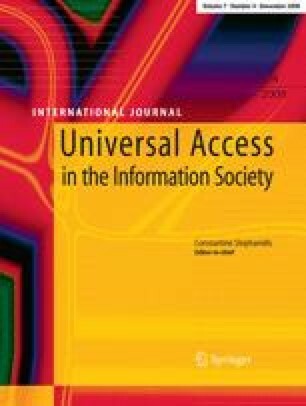 Utilizing Wiki-Systems in higher education classes: a chance for universal access? Wikis are a website technology for mass collaborative authoring. Today, wikis are increasingly used for educational purposes. Basically, the most important asset of wikis is free and easy access for end users: everybody can contribute, comment and edit—following the principles of Universal access. Consequently, wikis are ideally suited for collaborative learning and a number of studies reported a great success of wikis in terms of active participation, collaboration, and a rapidly growing content. However, the wikis success in education was often linked either to direct incentives or even pressure. This paper strongly argues that this contradicts the original intentions of wikis and, furthermore, weakens the psycho-pedagogical impact. A study is presented which focuses on investigating the success of wikis in higher education, when students are neither enforced to contribute nor directly rewarded similar to the principles of Wikipedia. Amazingly, the results show that, in total, none of the N = 287 students created new articles or edited existing ones during a whole semester. It is concluded that the use of Wiki-Systems in educational settings is much more complicated, and it needs more time to develop a kind of “give-and-take” generation.